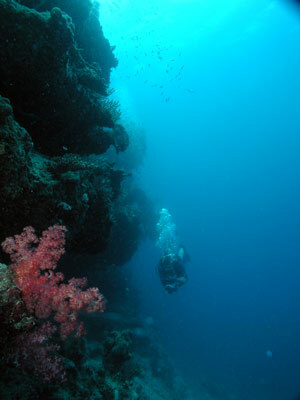 This dive site is located at the southern end of Ribbon Reef No 7, just inside the channel between the reef and a smaller reef. This is 144 kilmotres almost due north of Port Douglas. The GPS Reading for the location is S15° 12' 20.0" E145° 43' 30.6" using WGS84 as datum. 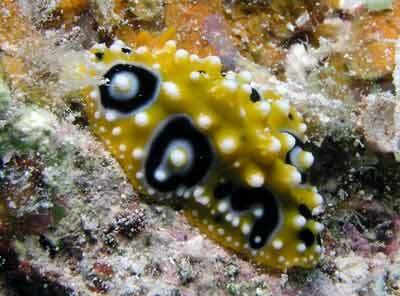 The site consists of a large coral bommie that comes up from 30 plus metres to 3 metres. The bommie drops vertically from 3 metres on the top to 12 metres on northern and eastern sides and 17 metres on the western side. The sand slopes from the bottom of bommie to over 30 metres. The top of the bommie is about 30 metres E-W and 40 metres N-S. There is a mooring on top of the reef. Drop to bottom about 25 metres and start circling the bommie. There are lots of small coral bommies, about one to two metrs across and a metre high. THese bommies have lots of live corals, sponges and some other species. As you go, come up a few metres every quarter turn. Zig-zag as you go, from bommie to bommie. On the northern or souhtern sides (where you may encounter some currents), look out for pelagic species. There are many types to see, ranging from tunas to trevallies to xxxx. You can get some good photos of coral and the bommie in the background. As you get closer to the base of the bommie, you will also see some small overhangs, especially on the northern side. 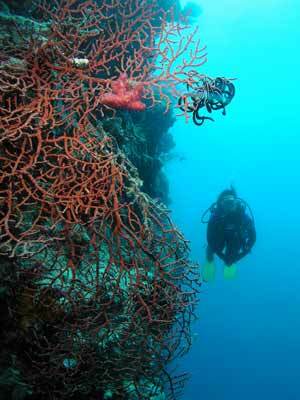 As you start up the verical walls of the bommie, look for gorgonias and .soft corals that will make good photographs. Towards the top of the walls there are a couple of cracks that lead to the bowl in the centre. There is also a smaller bommie off the (eastern?) side. Along the top edge and in the cracks there are some excellent gorgonias and soft corals and sea whips. These are very photogenic. Inside the bowl the depth is only about 3 to 4 metres. The coral life here is fantastic. 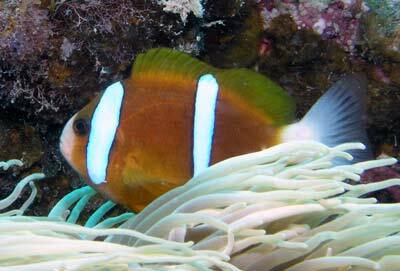 All sorts of corals can be seen and there are lots of anemones, clownfish and other small fish. You will see lots of things and can spend a long time in this area. Fish to be seen here (as well as the pelagics), titan triggerfish, unicornfish, large tuna, flutemouth, double-humped parrotfish and more. Visibility here is normally good, from 20 to 30 metres on average. Temperature is about 25C in November.